Beginning in 1957, two years before his breakthrough assemblages, Arman experimented with found objects in another manner: he inked them and then stamped, dragged, rolled, and tossed them onto and across a support. The results were the Allures d’objets, conceived as “object traces,” or records of each item’s kinetic behavior. 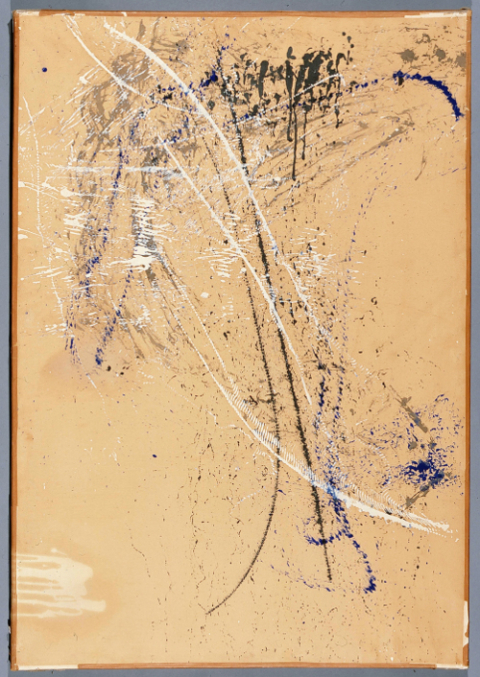 What looked like gestural abstract paintings were in fact indexes of the paths traveled by small objects like beads, eggs, shells, and shattered glass. Pierre Restany, Arman’s critical champion, argued that these traces were “objectified” in that the artist’s intentionality was superseded by the will of the objects themselves. This article questions the notion of an “objectified” gesture and considers the implications of the commingling of agencies in the indexing of objects. I argue that Restany’s attribution of self-determinacy to the object reflects his desire to fit Arman’s Allures d’objets into his own developing theory of a new realism. That theory, which would soon be codified as Nouveau Réalisme, insisted on the direct appropriation and unmediated presentation of “the real.” As such, it necessarily de-emphasized the artist’s gesture. In this article, I contend that Arman’s work resists this classification, and I recast the Allures d’objets as evidence of Arman’s own vision of realism, one that reveals the impossibility of pure objectivity. Dès 1957, deux ans avant ses célèbres accumulations, Arman fit une série d’expériences avec divers objets, qu’il recouvrit d’encre avant de les traîner, rouler, jeter sur un support, créant ainsi la série Allures d’objets, traces ou empreintes enregistrant le parcours effectué par les objets. Les œuvres semblent des peintures abstraites alors même qu’elles enregistrent la trajectoire de petits objets comme des perles, des œufs, des coquillages, des tessons. Pierre Restany, le principal critique et défenseur d’Arman, avance que ses traces étaient « objectifiées » puisque la volonté de l’artiste se trouvait dépassée par la volonté des objets eux-mêmes. Cet article interroge la notion même du geste « objectifié » et les divers facteurs à l’origine des empreintes. L’attribution par Restany d’une volonté propre aux objets dérive, selon nous, de son désir de faire entrer les Allures d’objet d’Arman dans le cadre de sa théorie du Nouveau Réalisme, qui mettait en avant l’appropriation directe et non-médiatisée du « réel ». De ce fait, le Nouveau Réalisme discréditait le geste de l’artiste. Cet article développe l’idée que les œuvres d’Arman résistent à cette catégorisation, et ses Allures d’objet reflètent sa propre vision du réalisme, qui révèle l’impossibilité de l’objectivité pure. 1On October 27, 1960, with the Declaration of Nouveau Réalisme, eight European artists and the critic Pierre Restany established an artistic movement that promised “new perceptive approaches to the real” (Restany, Déclaration n. p.; my translation). The concept of “the real,” though never adequately defined, would serve as a rallying cry for certain artists of the postwar generation who sought an alternative to what was then dominating the art scene, particularly in France: abstraction lyrique, a gestural mode of painting that foregrounded the artist’s subjectivity, accessible through the traces of his or her touch. 2In his first manifesto of Nouveau Réalisme, Restany announced the “sclerosis” of the prevailing modes of art-making—namely, gestural abstraction (“La réalité dépasse la fiction” 267). He equated gesture itself with the kind of introspection he saw in the work of Jackson Pollock and his generation: the autographic mark was the mark of an inward turn, an evasion of concrete reality. Restany, in his co-founding of Nouveau Réalisme, called instead for an outward turn—an extroversion, an embrace of “the real” rather than a psychic flight from it. Implicated in this call was the abandonment of gesture itself, the erasure of the artist’s subjectivity in favor of an objective acceptance of unadulterated reality. 3Arman, a founding member of Nouveau Réalisme, has often been held up as the most stringent adherent to the new realism. The assemblage works for which he is best known, the Accumulations and Poubelles that he began making in 1959, appear to leave out the artist’s hand altogether (examples at https://mcachicago.org/​Collection/​Items/​1960/​Arman-Alarm-Clocks-Reveils-1960 and https://www.centrepompidou.fr/​cpv/​resource/​czbB9a/​rzAeyed) In these vitrines of real objects, culled directly from the everyday world, we see no trace of the artist’s self, no indication of his psychic state, no distinguishing mark that would suggest his identity. But Arman did not arrive at these assemblages through an abrupt abandonment of gesture. Instead, his first forays into a new realism grew out of a gestural practice, which he attempted to objectify. In the pictorial works that Arman created just prior to the breakout assemblages, he imagined a gesturality that was not tied to his own subjectivity—that did not evade reality like abstraction lyrique, but instead seized it and inscribed it directly in its form. 4In this essay, I consider the implications of Arman’s invention of a “realist” gesture—a gesture that, according to the artist and to his critical champion Restany, captured reality objectively. The key series in this discussion are the Allures d’objet (Figures 1 and 4), begun in 1957, for which Arman inked various found objects and then stamped, dragged, rolled, and tossed them onto and across a support. The resulting marks were conceived as “object traces,” or records of each item’s kinetic behavior. What looked like gestural abstract paintings were in fact indexes of the paths traveled by small objects like beads, eggs, shells, and shattered glass. Restany argued that these traces were the result not only of the artist’s gestures but of the object’s gestures. Granting agency to the ink-covered object itself, he declared that once it is released onto the support, the object performs independently, laying down its trace as if writing in its own script. The gestures captured in the indexical marks, then, are “objectified” (Restany, “À toute allure” 264; my translation), as the artist’s will is superseded by the object’s organic behavior, which is ultimately inscribed on the surface of the support. Figure 1. Arman, Untitled, 1958. Traces of objects on paper strengthened on canvas. © 2018 Artists Rights Society (ARS), New York / ADAGP, Paris. Photo courtesy Fondation A.R.M.A.N. 5This essay questions the notion of an “objectified” gesture and challenges the assertion of commingling agencies in the indexing of objects. I argue that Restany’s attribution of self-determinacy to the object reflects his desire to fit Arman’s Allures d’objet into his own developing theory of a new realism, which insisted on the direct appropriation and unmediated presentation of “the real.” In exploring the artworks themselves, as well as contemporary criticism that dealt with both the Allures d’objet and the issues of realism more broadly, I point to the inconsistencies between the artworks and their commonly accepted interpretations. Ultimately, I argue that the Allures d’objet, and the discourse surrounding them, represent an important locus of many of the prevailing concerns for the generation of artists seeking an alternative to gestural abstraction in the postwar years. 6The Allures d’objet have received relatively little critical attention, as they predate the founding of Nouveau Réalisme and sit uneasily in relationship to the movement’s predominant narrative of an object-based realism. The Allures were left out of Arman’s first major retrospective, organized by Daniel Abadie at the Galerie nationale du Jeu de Paume in 1998; that show began with the breakout assemblage works of 1959 and excluded all works on paper, effectively asserting that the artist’s career, and by extension his larger artistic project, began with the Accumulations and Poubelles of his Nouveau-Réaliste period. A more comprehensive exhibition dedicated to Arman was mounted in his hometown of Nice in 2001; that one did include the Allures d’objet, as did his most recent retrospective at the Centre Pompidou in 2010. The latter two shows acknowledged a fundamental continuity between Arman’s earliest works and his most impactful ones, showing how his experimentations on paper led him to the development of his object-based works. I argue further that the Allures d’objet addressed the same stakes as the assemblages: namely, the probing of the limits and parameters of realism, and the role of the artist’s hand therein. These concerns were central to Arman’s project even before the establishment of Nouveau Réalisme; as early as 1954, he was making works on paper that represent his first propositions for a new realism. 7To Restany, whose prolific series of manifestos, catalog essays, and reviews came to define the movement, the goal of the new realism was to capture “the real” itself, not through representation but through presentation. This meant a renouncing of pictorial, sculptural, and other handicraft—a removal of the artist’s own subjectivity and any trace of his or her hand. In their place was objectivity: for Restany, the new realism meant letting objects stand for themselves. In the first manifesto of Nouveau Réalisme, he defined the movement as “the passionate adventure of the real perceived in itself and not through the prism of conceptual or imaginative transcription” (Restany, “Les Nouveaux Réalistes” 265; my translation). Thus the idea of the artist’s gesture inhering in some way in the work of art became, for Restany and for Nouveau Réalisme, a kind of taboo. 8In keeping with his vision of art history as a series of ruptures, Restany defined Nouveau Réalisme in strict opposition to the abstraction lyrique that was then ubiquitous. His call for artists to “put their feet back on the ground” (“Art et technologie” n.p. ; my translation) and embrace the new reality, rather than retreat from it as he saw the abstract painters doing, was a call for a kind of authorlessness that would let that reality suffice in and of itself. Thus, for the Allures d’objet to be embraced as realist, despite their surface resemblance to Abstract Expressionism, required a certain discursive manipulation. This manipulation is best understood in the contexts of Arman’s own emergent artistic project and of the broader conversations about realism and “the real” in the late 1950s and early 1960s in France. 9Arman had in fact begun his artistic career as an abstract painter, in the manner of Serge Poliakoff and Nicolas de Staël—a style that is notably less gestural and less inward-turning than that of Pollock. Arman’s abstractions, like those of Poliakoff and de Staël, were grounded in the observation of external reality; they were often suggestive of landscape, and lacked the kind of pulsating energy and psychic power of Abstract Expressionism. But in 1954, after having seen two key exhibitions—Pollock’s 1952 European première at Studio Facchetti and Kurt Schwitters’s 1954 retrospective at the Galerie Berggruen—and after discovering the work of Hendrik Nicolaas Werkman in an issue of Art d’aujourdui on graphism, Arman began to experiment with different media and different modes of applying pigment to canvas. And, like many young artists looking for an alternative to the bold abstractions that dominated European galleries, he began to think about more direct ways of connecting his work to the outside world. 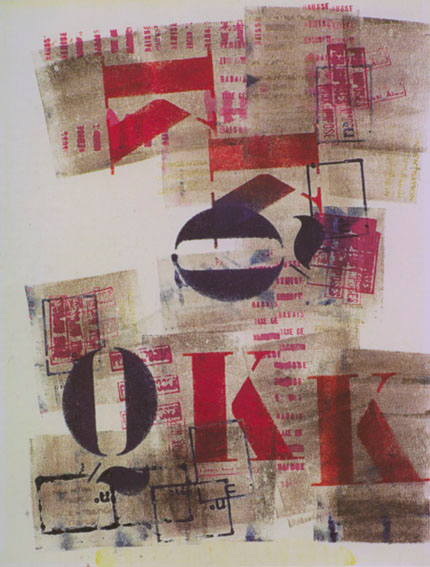 10Drawing on Schwitters’s embrace of everyday objects and Werkman’s typographic style, Arman reached first for office inkstamps, and used them to create graphic, allover compositions he called Cachets (Figure 2). What the stamps offered to Arman was a way of “painting” with “the real,” using a key new discovery: the index. Arman recalled, “I started experimenting with inkstamps, with imprints of objects, things like that. There was thus, little by little, from the mid-1950s, the introduction of the object, not as such, but in the form of imprints and traces” (Abadie and Arman 37-38; my translation). In this statement Arman relates—and at first almost conflates—the object itself and its index. He considers the inclusion of the object’s imprint or trace to be in the category of “introducing the object”; this perception confirms that his early works were an integral part of his pursuit of an object-based realism. If he envisions realism as the inclusion of the literal “real” in the work of art, and if he sees the index as equal or at least analogous to “the real,” then the Cachets and Allures d’objet, despite their abstract pictorial form, figure among Arman’s earliest realist pictures. Figure 2. Arman, Cachet, 1955. 31 x 24 cm. Prints of rubber stamps on paper. Location unknown. © 2018 Artists Rights Society (ARS), New York / ADAGP, Paris. Photo courtesy Fondation A.R.M.A.N. 11The Cachets presented an immediate problem, however. Though the medium would seem to allow the kind of authorial distance and objectivity that Arman sought and that the new conception of realism demanded, the resulting compositions made explicit the process of their realization, and consequently made evident the artist’s hand. Although the Cachets lack the immediacy of a calligraphic brushstroke, Arman’s personal mark is still inscribed in them. The imprints, in their overlapping, compromise the integrity of the individual stamps, thereby making the composition more about the arrangement of those forms. The viewer is compelled not to decipher the content of the stamps, but to take in the rhythmic patterns of marks. Thus a process that would seem to produce an anonymous, anti-subjective form—the form of bureaucracy, most familiar to these stamps’ quotidian use—turns out to be an expression of the artist’s choices in composing the overall picture. The Cachets become a record of the artist’s gestures as much as they serve as indexes of the stamps themselves. 12Over time, what began as an exercise in the almost mechanical action of stamping developed into a more expressionistic experimentation. The Cachets became increasingly lyrical as Arman dragged, turned, and rubbed the stamps across the support, and as he began to incorporate the impressions of other small objects as well. In Cachet Carmélite of 1957 (Figure 3), for example, the standardized stamps of numbers and letters commingle with imprints of an apparent wire mesh, as well as scrawl-like traces of some object that appears to have been pulled across the surface in various patterns, from the circular to the zigzag. These expressionist markings anticipate the form and technique of his next series, the Allures d’objet (Figures 1 and 4). Figure 3. Arman, Cachet Carmélite, 1957. 150 x 260 cm. Traces of stamps and objects on paper. Private collection. © 2018 Artists Rights Society (ARS), New York / ADAGP, Paris. Photo courtesy Fondation A.R.M.A.N. 13As he reached for different kinds of objects to ink, Arman turned his focus to the ways in which an object’s trace could be the index of that object’s behavior as it moved onto or across a surface. No longer exactly an impression, the index was now a mapping of the object’s spatial and temporal displacement on the support. The irony of the transition from one series to the next is that the Allures d’objet—despite being significantly more abstract, the referents of the indexical marks much harder to identify—were immediately understood as more realist than the Cachets. How could this be? The realism of both series depended on their status as indexes: that the real objects that created these marks inhered in some way in the compositions. Their reality and presence as objects were confirmed by the traces that directly repeated their form or movement—that presented them rather than representing them. But those traces are far more legible in the Cachets: we can make out the exact shape and size of the stamps, as well as their textual or numeric content. In the Allures, we are hard pressed to identify what, exactly, has created these abstract marks. So how could the latter be understood as more realist? Through an interpretive convolution: one that identified these abstract traces as the autographic markings not of the artist but of the objects themselves. 14One could already detect a kind of “writing” in Cachet Carmelite, where the forms of some of the black and ocher lines, particularly across the lower-central portion of the canvas, mimic cursive script. Of course, those calligraphic lines, so evocative of handwriting, work against the contemporary realist desire for authorial distance and Arman’s own anti-autographic stance. Arman had replaced the paintbrush with the inkstamp in part to get away from his own autographic mark, but as soon as he began to drag the stamps rather than simply impress them, he enacted a form of handwriting. The objects simply became surrogates for the pen or the paintbrush; since their material properties were no longer evident in the traces, the hoped-for “objectivity” gained by the use of non-art objects was nullified by that very use. The move to the Allures d’objet, where the objects would allegedly be given more autonomy, can therefore be seen as expressing a will to self-effacement and a re-activation of the object as object and not as tool. If it is the trace of the object that interests Arman, then in the Allures d’objet he needed to remove himself from the equation in order to allow that trace to express only the object, and not the artist-agent’s manipulation of it. 18In a few short sentences, Restany slyly introduces several complex notions about gesture and agency. According to Restany, the artist first exerts control by selecting objects not for their inherent object qualities, but for their perceived kinetic potential. Once the objects are selected, it is they who determine the actions that will be taken on them. But those actions do not constitute the crux of the creative process. Instead, the object is guided by its own reason, and performs according to it. But on what is that object-reason based? How can an object have reason not imposed or projected on it by a willful human mind? Restany does not answer those questions, but he seems to suggest that the object’s reason is specific to its particular form—that each object has an “essence,” and that that essence determines the object’s behavior and, consequently, governs Arman’s selection and treatment of it. 19In attributing the qualities of essence and reason to objects, Restany gives them a level of agency that stops just short of autonomy. Without entirely obliterating Arman’s role, he establishes the artist as one who allows the particular object, imbued with its own intrinsic agency-essence-reason, to dictate the form his art will take. The gestures are objectified in that they reflect the objects’ behavior, their “natural” writing. 21Arman himself embraced this reading. In fact, a year earlier, in 1959, he had collaborated with Jacques Brissot on a film, Objets animés, which essentially made the argument that Restany would soon articulate.2 The film flickers between shots of the marks left by the objects Arman rolls or throws across his canvases, and shots of similar indexical mark-making in the natural world: waves leaving their trace on wet sand, seaweed washing ashore and combing the beach behind it. Footage of an Allure d’objet made by dropping an inked steel spring on paper is interrupted repeatedly by footage of colossal industrial coils dropping to the ground in a junk yard, leaving their own marks on the earth. Arman and his hands are absent from the film; the inked objects, like the natural and industrial ones, appear to move about on their own. Brissot and Arman thus establish a parallel between Arman’s practice and natural or found phenomena, and in so doing they assert the realness of the index, its truth as a mark, suggesting its naturalness, uncorrupted by human will. 22It is by virtue of the object’s action and the artist’s minimized role that the Allures d’objet are distinguished from the Cachets, and move closer to the direct confrontation with reality that Arman sought.In the Cachets, the forms of the compositional elements are predetermined, but their arrangement is decided by the artist’s conscious or intuitive choices. With the Allures d’objet, Arman allegedly relinquishes control of the final composition of the no-longer standardized forms. By tossing or dropping the object, Arman allows chance and the natural laws governing that object—its mass, the balance of its weight, its material—to determine the placement and form of the irregular marks on the support. In this way, he begins to work toward a solution to the discord of the Cachets, where the mechanicity of the individual forms works in opposition to the expressiveness of the arrangement of those marks. Now, in the Allures d’objet, the expressiveness comes from the objects themselves, rather than the artist’s intuition, thus moving the Allures paradoxically further from Abstract Expressionist painting, even as on the surface they resemble it more. 23On the question of the artist’s role or presence in the Allures d’objet, Emmanuelle Ollier has recently discussed the material pictures as the “fruit of a bygone action.” The work of art, she claims, “makes absent the entire gestural process of the artist, omitting its active principle and the vitality of the process of creation” (Ollier 47; my translation). But to forget the artist’s presence in these compositions would be to imagine objects able to activate their own kinetic potential. We know— and often can clearly see—that Arman has intervened in the direction or coaxing of the inked objects across the surface of the support: he might tilt the canvas to cause a ball to travel in a particular direction, or he might apply more or less pressure to a beaded necklace to change the density of its traces. Ollier’s suggestion that any trace of the artist is absent from the final composition echoes Restany, who wrote in 1968 that the Allures reflect “the expressive autonomy of the object, where reality has been allowed to “suffice for itself?” (“Arman, un regard” 269; my translation). Figure 4. Arman, L’Amble de l’oeuf, 1957. 65 x 50 cm. Traces of objects on paper. Location unknown. © 2018 Artists Rights Society (ARS), New York / ADAGP, Paris. Photo courtesy Fondation A.R.M.A.N. 25The coefficient of reality guaranteed by the indexical nature of the artist’s process in the Allures d’objet is thus challenged by the abstract nature of the resultant marks. The indexical signs left by the objects used in an Allure d’objet most often do not in fact point to—that is, index—the specific object whence they were born. And yet we know, not only from Arman’s artistic practice but also from his writing, that the index, with its elevated relationship to reality, was of paramount importance to him. The index represented for Arman a certain access to or corroboration of reality in its physical connection to its referent. 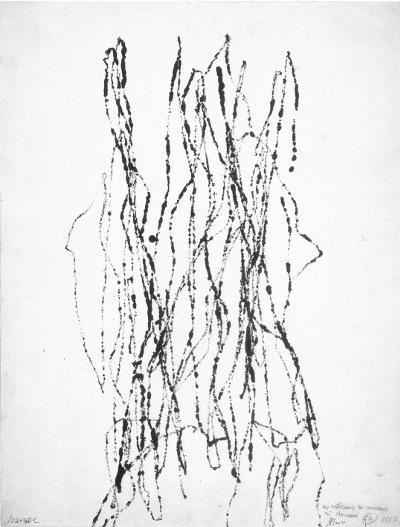 He described his use of imprints and traces in the early works as “a technique for stealing the direct image from the object as an action” (qtd. in “Romanticism of the Object” 75). Arman’s language emphasizes two key realist concepts: the directness of the object’s trace, and the objectivity of the process of obtaining the image from the object itself, rather than recreating it anew in what would conventionally be called a representation. 26But the Allures d’objet, in their very form, call to question the directness and objectivity of that image and that process (to see more examples you can consult http://arman-studio.com/​catalogues/​catalogue_allure/​arman_all_list.html). Just as the viewer cannot always make out the object-referent, one also struggles to ascertain exactly what actions were taken on these objects, and how much of what one is seeing is the result of chance versus intention. We might wonder whether that effect was deliberate; it seems likely that an artist seeking to present “the real” in its most sincere form would have a vested interest in blurring the distinction between the object’s behavior and his or her own. As Jan Van der Marck has argued, although Arman subtly manipulated the objects and steered their trace-making, “the means are fully subsumed by the ends and all we are aware of are hints, glimpses and allusions” (13). We cannot quite distinguish the artist’s gestures from the object’s. And contemporary assessments of the Allures d’objet reveal that this ambiguity was central to the works’ reception. 27In a review of Arman’s 1960 exhibition at the Galerie Saint-Germain, an unnamed critic for the journal Combat touched on the collaborative aspect of the artist-agent and object-agent in the making of the Allures d’objet: “It is the object that intervenes between the canvas and the painter and the latter does not work forbut ratherwitnesses the representation of [his/its]5 gesture according to different givens, according to different kinetics, according to different densities” (“Arman à la Galerie Saint-Germain” 9; my translation). The notion of Arman as witness ascribes him a passive role, whereby rather than laboring to produce the work of art, he simply watches it unfold—as if it were a natural phenomenon like a wave crashing upon the sand. It is worth noting that the notion of artist as “witness of his time” would become a key tenet of Nouveau Réalisme: the artist, for this new generation, was to be not so much a creator, but an observer and collector of reality. The reviewer further explains,“Arman witnesses the life of the chosen object, for it lives as soon as it moves, as soon as it is propelled, as soon as it is submitted to gesture, to speed, in a word to displacement” (9). Note the canny slippage of agencies here. The object has a life, which the passive artist merely witnesses. But that object lives only when it is submitted to the artist’s gesture. The “objectified gestures” are thus not purely objective; we understand implicitly that these traces could not exist without the artist. Does this not imply that the traces inscribe something of the artist’s actions into the work of art as well? Do they not index the artist’s presence as much as the objects’ presence? 1st The linear, sinuous and thick path represents the course of a pebble rolling irregularly on all sides. 2nd The central, bursting rectangular spot is the mark of a strong lashing acted out on the surface of the paper with the help of a rubber strap. 29The necessity of this addendum to the image begs the question: what good is the index if its referent—both the object and the gesture or movement—cannot be ascertained without discursive intervention? Does not this need for explanation work against the effort to eschew representation in favor of direct presentation? This seems to have been the consensus in the early 1960s, when Arman abandoned his pictorial practice for an assemblagist one. Critic Alain Jouffroy noted at the time that the Allures d’objet, because of this distance between index and referent, stopped short of true realism. He praised the understated beauty of the works, but lamented, “[B]ut the trace of an object is not the object. Its imprint, although ‘poetic,’ does not attain the degree of virulence of the lived, the palpitating, the true” (Jouffroy 266; my translation). 30Gestural traces, no matter how objectified, simply could not stand in for reality itself. As the avant-garde aligned with contemporary thinking about the need for authenticity in the face of encroaching spectacle, representation of any kind became undesirable. The unmediated real itself, presented directly, was the order of the day, to paraphrase Restany—and it was becoming clear that that meant the abandonment of gesture altogether. 31The Cachets and Allures d’objet that Arman produced over the course of the first five years of his ambitious artistic practice represent a nuanced exploration of the complexities of indexicality, agency, subjectivity, and representation. Those concerns, all bound up in the contemporary debates about the possibilities of realism, would remain central to Arman’s artistic pursuits over the next five years, as he developed his œuvre against the backdrop of Nouveau Réalisme. What the Cachets and Allures d’objet reveal is the way in which for one artist, the abstraction lyrique of the immediate postwar years gave way to a new realism not through an abrupt abandonment of gesture, but through an investigation into its potentials and limitations within the new sociological and aesthetic context of the late 1950s and early 1960s. Arman’s revelation of the impossibility of objective gestures provides one account of how gestures came to be rebuked entirely by a new generation of artists. ABADIE, Daniel, and ARMAN. “L’archéologie du futur.” Arman. Ed. Daniel Abadie. Paris: Éditions du Jeu de Paume, 1998. 37-63. “Analyse d’allure.” Text from a printed insert in the invitation to the exhibition “Arman: Allures d’objets,” Galerie Saint-Germain, Paris, March 16 to April 9, 1960. Fonds Pierre Restany, Archives de la critique d’art, Rennes. 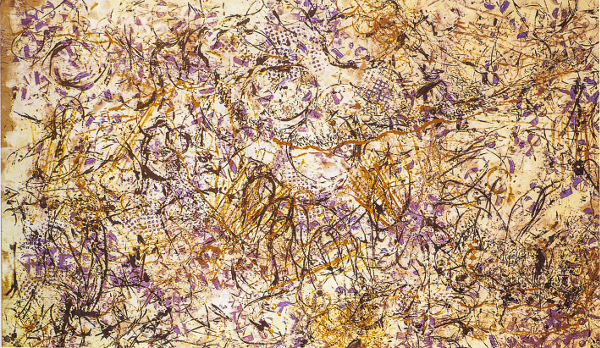 “Arman à la galerie Saint-Germain: Recherche de la matière.” Combat 21 (March 1960): 9. BRISSOT, Jacques, dir. Objets animés. 1959. HAMILTON, Jaimey. “Arman’s System of Objects.” Art Journal 67:1 (2008): 54-67. —. “Civilisation figée: Notes sur l’esthétique de la systématisation chez Arman.” Arman. Ed. Jean-Michel Bouhours. Paris: Centre Pompidou, 2010. 56-63. JOUFFROY, Alain. “Arman.” 1963. Arman. Ed. Jean-Michel Bouhours. Paris: Centre Pompidou, 2010. 266. Originally published in Arman. Milan: Galleria Schwarz, 1963. OLLIER, Emmanuelle. “Arman et l’esprit du Bushido: La quête du geste parfait.” Arman. Ed. Jean-Michel Bouhours. Paris: Centre Pompidou, 2010. 46-55. RESTANY, Pierre. “À toute allure.” 1960. Arman. Ed. Jean-Michel Bouhours. Paris: Centre Pompidou, 2010. 264. Originally published in the invitation card for the exhibition Arman Allures d’objets, Galerie Saint-Germain, Paris, 1960. —. “Arman: un regard toujours neuf sur le monde.” 1968. Arman. Ed. Jean-Michel Bouhours. Paris: Centre Pompidou, 2010. 269-270. Originally published in Arman. Milan: Galleria Schwarz, 1968. —. Déclaration constitutive du Nouveau Réalisme. Various pencils on IKB paper. 1960. Musée National d’Art Moderne, Paris. ________. Manuscript for the lecture “Art et technologie,” Saint-Luc Gand (May 23, 1964). Fonds Pierre Restany, Archives de la critique d’art, Rennes. ________. “Les Nouveaux Réalistes.” 1960. 1960, Les Nouveaux Réalistes. Paris: Musée d’art moderne de la ville de Paris, 1986. 264-265. Originally published in Arman, Dufrêne, Hains, Yves le Monochrome, Tinguely, Villeglé. Milan: Galleria Apollinaire, 1960. ________. “La réalité dépasse la fiction.” 1960. 1960, Les Nouveaux Réalistes. Paris: Musée d’art moderne de la ville de Paris, 1986. 267. Originally published in Le Nouveau Réalisme à Paris et à New York. Paris: Galerie Rive Droite, 1960. “Romanticism of the Object: Arman’s New Drawings.” Arts Magazine 50, no. 4 (December 1975): 75. STEINBERG, Leo. “Other Criteria.” Other Criteria: Confrontations with Twentieth-Century Art. London: Oxford University Press, 1972. 55-91. VAN DER MARCK, Jan. “Arman: An Archeologist of the Present.” Arman: Selected Activities. New York: John Gibson Gallery, 1973. 20. 1 Of course, even in the Accumulations, Arman’s hand is present in the acquisition and arrangement of objects. His failure to fully erase himself from the composition relates to the participant-observer position that Hamilton identifies as characteristic of Arman’s relationship to consumer society. She concludes that Arman is both witness to his time and participant in it: in his obsessive practices of acquiring, hoarding, arranging, and caring for his objects, he becomes a consuming subject even as he sets out to merely observe those behaviors (“Arman’s System of Objects” 56-58). 2 The film is available at http://fresques.ina.fr/artsonores/fiche-media/InaGrm00807/jacques-brissot-objets-animes.html (page accessed on April 23, 2018). 3 This work is one of very few in which the listed materials name the object used to create the traces. In many instances, the only material descriptor given is the vague phrase “traces of an object.” The title that describes the process (the amble of the egg) is also anomalous in the series. 4 Leo Steinberg devised the term “flatbed picture plane” to describe Robert Rauschenberg’s and Jean Dubuffet’s paintings from the same period, beginning around 1950. Steinberg recognized a particular and unprecedented phenomenon at work in those artists’ pictures, whereby the compositions resolutely declare the processes of their making—processes that were, importantly, performed on a horizontal surface like a table, desk, or floor. “The pictures,” wrote Steinberg, “insist on a radically new orientation, in which the painted surface is no longer the analogue of a visual experience of nature but of operational processes” (84). 5 In the original French, it is impossible to distinguish which pronoun is intended here: “C’est l’objet qui s’interpose entre la toile et le peintre et celui-ci n’œuvre pas mais assiste à la représentation de son geste selon différentes données, selon différentes cinétiques, selon différentes densités.” The ambiguity inherent in the language, where “son geste” can mean either “his [Arman’s] gesture” or “its [the object’s] gesture,” further deepens the confusion of agency in the Allures and in our perception of them.